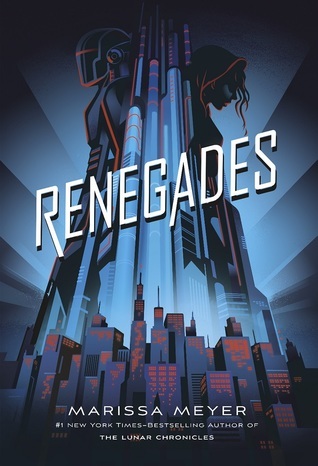 Goodreads Synopsis: The Renegades are a syndicate of prodigies — humans with extraordinary abilities — who emerged from the ruins of a crumbled society and established peace and order where chaos reigned. As champions of justice, they remain a symbol of hope and courage to everyone… except the villains they once overthrew. I will completely admit that I have never been a fan of Marissa Meyer. I truly disliked her standalone novel Heartless and while Cress was my favorite in the Lunar Chronicles, I have no interest in finishing the series. So I figured this superhero and villain book was my last chance for her books. And OH MAN was I impressed! This series opener, while it is a tiny bit slow, is so interesting and was so refreshing to listen to. I barely managed to finish this book on the last day of 2018 and it was a great way to end the reading year. I know this series is popular, but if you’ve been curious about this series, here’s five reasons to listen to this book! The whole world was affected by the Prodigies and it was really interesting to hear about the consequences. Many were killed and feared for their powers and the world was at conflict for a time before being more accepting. But in this particular city of New Gattlon, the conflict is especially interesting. There was a huge battle between the Renegades and Anarchists, which resulted in a deeper hatred of the other and forced the Anarchists into hiding. But only that, there are some cool discussions of what it means to be a hero, what makes someone a villain and those that are in between. The intrigue offers you enough in this first book for another promising installment. I really loved Nova and Adrian! Nova was a fantastic character to have a POV from. Her family was killed when she was young and she had believed that the Renegades would come and save them, but they didn’t. So she infiltrates the Renegades to get revenge and find out a plan to destroy them. What surprised me is that she’s not completely evil. She has the most complexity of all Marissa Meyer’s characters I’ve read from. She’s lonely, angry, suspicious but also finds new feelings with infiltrating the Renegades. Then, we have Adrian, who is the son of two Renegade council members. He has a secret of his own and he really shows that he’s not like his two dads. He wants to do the right thing but knows that he doesn’t completely agree with the council. Both do have moments of actually being teenagers, which was sweet since they’ve been through so much. While there is a hint of a romance, I was so happy that it didn’t take over the story. It was slow to start and felt real for me and I’m sure that more will come in the next book. If you’ve listened to the audio books for Marissa Meyer, then the amazing Rebecca Soler won’t be a stranger to you. She continues to amaze me with her audio performances, especially in last year’s YA thriller Sadie. In here, she IS Nova with her feelings of revenge, frustration, uncertainty but also a deep vulnerability that she tries to hide. We also have Dan Bittner, who was also in the audio cast of Sadie and also did great here. While I think his voice is slightly old for Adrian, he still captures the sometimes fun, sweet but also hard moments of his personality. Both of them are a perfect mix of characters that don’t fit into either category. If you’re an audio book fan, this one is a must! So many of us just keep eating up all the Marvel movies and enjoying a couple DC ones (mainly Aquaman and Wonder Woman) so it’s not a surprise that Marissa Meyer jumped onto the superhero train. Many of the origin stories were very good in this first book. The first chapter is so painful with Nova, but then other characters you meet have interesting or tragic origin stories with their powers. Some are also powers I’ve never seen before and that made it even cooler. Meyer really uses her creativity with some of these side characters and I can’t wait for even more explorations of their powers throughout the trilogy. Small Con: I do have a small con and that was the dialogue being very cheesy at times, especially during the fight scenes between the Renegades and the Anarchists. It wasn’t often but I did snicker a couple times. But this hardly took anything away from the story. Overall: This was a fantastic series opener! I was proven wrong with all the intrigue, world building, main characters and origin stories for the heroes and villains. This gives you a lot for a first book and I know that there’s even more to come in the next book. If you’ve been wondering about this first book, I highly recommend it! Have you read this book? Did you also enjoy it? Is the sequel just as good? I LOVE this book! I haven’t gotten around to reading Archenemies yet, sadly. Ah ok I have heard that the sequel is really good so it makes me even more excited about reading it 🙂 I hope we both love it! Yay- so glad you enjoyed this!! I thought it was an awesome book 🙂 I loved the world building and the mcs so much!! That’s so cool about the narrators as well 🙂 Great review! I’m glad you loved it too 🙂 I was worried going into it and I’m wondering if my lower expectations helped? Yeah I think I had the same experience with it tbh and that helped!